This Dragon cider, or the so called a Dragon or Fire tonic is especially valued among herbalists! This infusion of apple cider vinegar contains powerful immunity enhancers, anti-inflammatory, antibacterial and antiviral properties and strong drivers of circulation and digestion. Easily and comfortably fits into your daily diet, raising immunity and stimulating digestion. It is especially known for its ability to prevent inflammation, symptoms of colds and flu and maximum shortening their duration if they occur. Keep in mind that it takes about a month to mature. 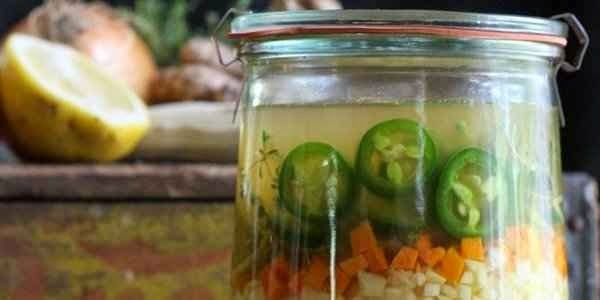 Put ginger, horseradish, onion, garlic, chili pepper and lemon juice with grated rind in a jar. Lay them gently, so that the jar is about ¾ full. Use the weight achieved by fermentation to keep vegetables / roots down, or place heavy roots on top so they will pull to the bottom peppers and other plants that float. Pour a generous amount of apple cider vinegar over the roots / vegetables. All ingredients should be covered with liquid to prevent spoilage. Keep in mind that some roots expand so make sure to cover enough. If using a metal cover, first put baking paper or gauze, so it will not vinegar won’t corrode. Store in a dark place at room temperature for 2-4 weeks, for a month. When the Dragon cider is done, stir well, then drain using gauze or a fine strainer. Add honey for taste and keep it in the refrigerator or a cool, dry place. Durability is long. How to consume Dragon cider? Many people take 1-2 tbsp as prevention or every three to four hours if there are symptoms of inflammation, colds or flu present. Dragon cider sounds like a mystical drug that could be found in fairy tales, but there is nothing magic about the ingredients! They are real and powerful. Make this powerful tonic and always keep it near you!